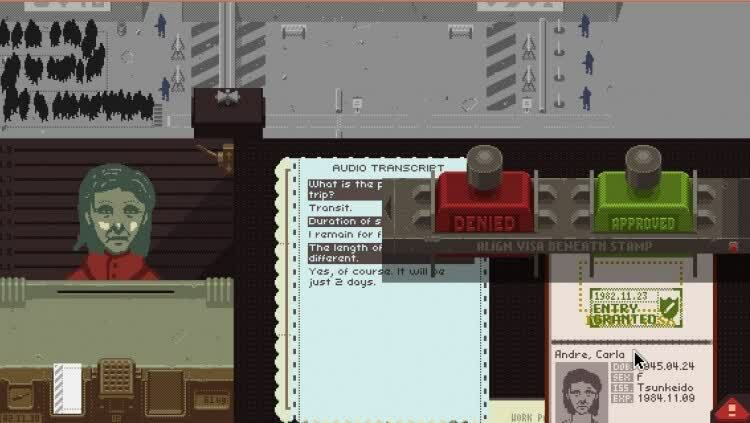 Papers, Please feels a lot like an interactive anxiety attack. It's hard to call such a nerve-shredding experience "fun", but it is absorbing, brilliantly written and causes you to question your every instinct and reaction - both in the game and in real life. 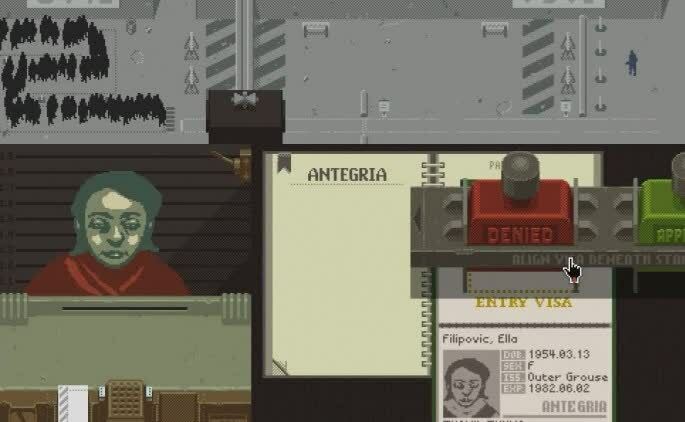 Such bleakness will be an acquired taste, of course, but the deep note of bitterness in Papers, Please makes for a welcome change. It's worthwhile for the same reasons a depressing novel or a bleak movie can be worthwhile. 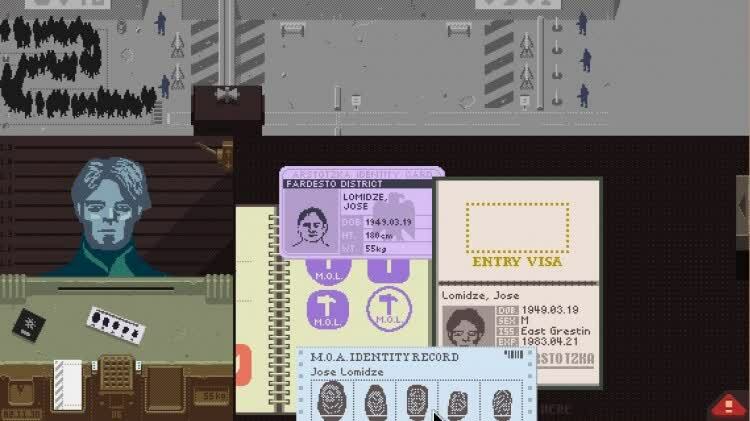 There are lessons to be learned from Papers, Please, if only to remind ourselves how much worse off we could be. 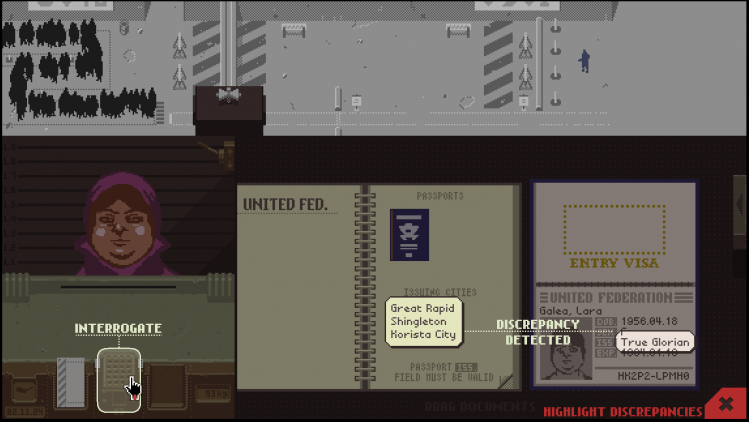 Never mind its bleak tone, minimalist presentation, and seemingly dour concept - Papers, Please turns checking passports into an unexpectedly captivating game. 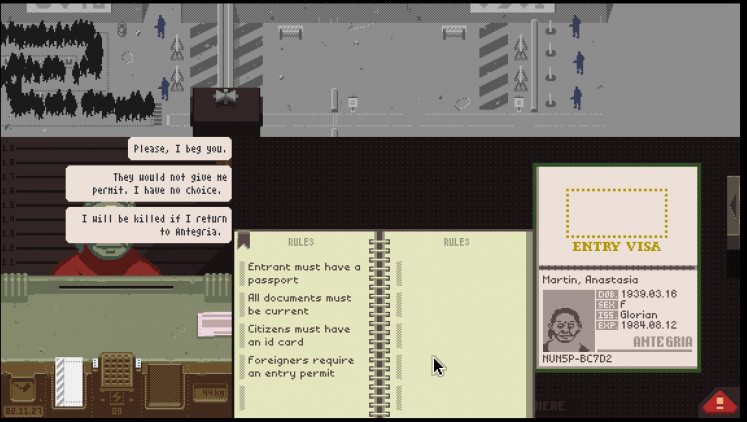 Very few other games have so perfectly encapsulated just how being trapped in this kind of dehumanising role can be, in the best possible way, and both inside and out of the dreaded grey booth. If only there could be an achievement for reaching the exact moment you turn someone away for no particularly good reason, only to quietly tell yourself that, as ever, you were just following orders. After racing through a traveler's files, preoccupied with the pressures of the job and paying for my virtual family, I had a forced, four-second gap while one walked away and another approached. This was my opportunity to really stop and think about my role in the act of processing people like so much cattle. 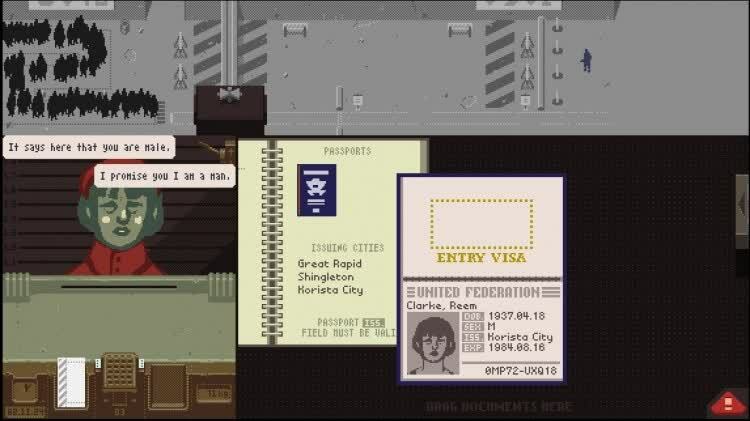 An Endless mode alleviates some of Story mode’s monotony by letting you compete on leaderboards for prestige, but above all Papers, Please is a $10 ticket to emotional manipulation, left brain stimulation, and elegantly-paced virtual paperwork wrapped in clever storytelling. That’s how much faith I have in this game; Lucas Pope broke down the genre barriers to create a title that is unrivaled in gaming. 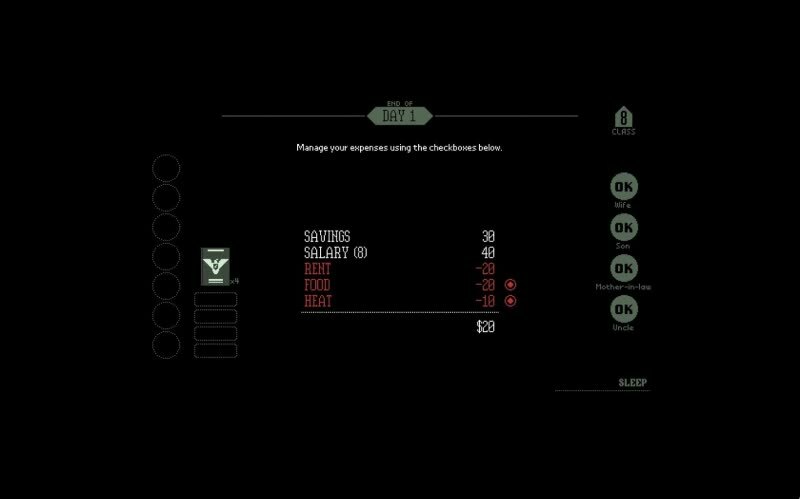 It is not strictly a strategy game, nor is it strictly about espionage, political commentary or action. It is described as a dystopian document thriller, but it is more than that. It is complex, but it is simple. 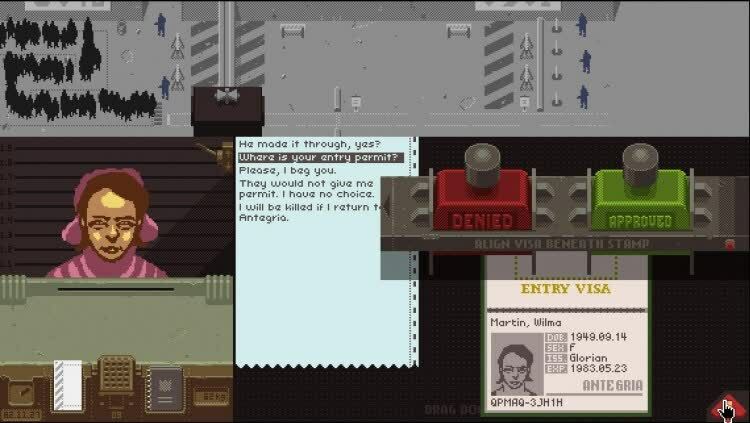 Papers, Please might sounds like it’s a little niche, that the appeal is too limited, but it’s about as much fun as you can have destroying the dreams of people hoping to better their lives.